From thought leadership to incredible stories of student success, this is where you can get informed or get inspired about scholarships and the educational journey. Two years ago, Janelle Wiser found herself drowning in responsibilities. As a college sophomore, she had many burdens to bear: working four jobs to keep afloat financially, juggling a full course load to continue her schooling, and picking up extra work hours to send money home to her family. The work was too much, forcing Janelle to drop extracurricular activities and a class that she had been struggling with — and threatening to make her quit school entirely. Her struggle to pay for college wasn’t Janelle’s first encounter with adversity. When she was just eight, her parent’s separated — leaving Janelle, her sister and her mother without a stable home for years. Her mother, diagnosed with cancer and multiple sclerosis, had to raise Janelle and her sister alone. Then in 2007, just as Janelle entered high school, her sister suffered severe brain damage in an auto accident. For Janelle, clubs and activities took a backseat to doctor’s appointments, full-time jobs and long hours helping with her sister’s rehab. 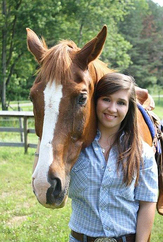 Still, the experience confirmed Janelle’s desire to help others in need, and carried over to her passion for animals. Janelle felt like she needed an outlet from all of the stress she experienced at home, so she adopted and rehabilitated a horse that had been severely abused. Thanks to her patience and hard work, the aggressive horse became a calm and gentle one. But just as Janelle began training him as a service horse for a boy with special needs, the horse was diagnosed with cancer. Knowing that she couldn’t afford the surgery to prolong the horse’s life, Janelle contacted her veterinarian about putting him down. Instead, the vet found a surgeon willing to transfer the horse to the veterinary hospital three hours away and to work at a discounted rate — making it possible for Janelle to cover his medical expenses. It’s this same kindness that Janelle wants to pass on to others. “I would love to be able to give animals and people a second chance, the way that [the vet] did for me,” she said. In the midst of significant challenges, Janelle’s mother heard about the Scholarship America Dream Award on TV while at the doctor’s office. Janelle was skeptical when she first heard about the program; she had had little luck with many other scholarship programs before. But, with financial pressure mounting, she took a chance on the application. 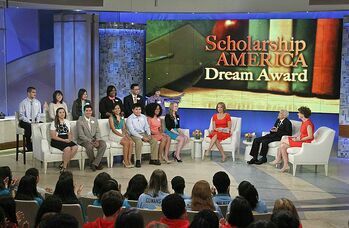 Fast forward to May 2014, when Janelle, along with 11 other students, were selected as finalists for the Dream Award and appeared on Katie Couric’s daytime talk show, Katie. What they didn’t know was that not one, but all 12 of them would be named Dream Award recipients. The awards, ranging from $5,000 to $15,000 per year and increasing by $1,000 each year, gave Janelle the breakthrough she needed. “It changed my life,” Janelle said about the scholarship. After receiving the Dream Award, Janelle was able to reduce her workload to just one job, focusing her attention on classes. She has the highest grade in the course she had to drop last year. In her spare time, she helps raise money for her school’s scholarship funds. And, with her school tuition now covered, her mother could afford the surgery she needed to alleviate pain she experienced. Thanks to you, Janelle is able to stay in school and help her family. Thanks to you, she doesn’t have to choose between work, family and education. And thanks to you, she can continue to pursue her dream of becoming a veterinarian. Education is the gift that lasts a lifetime!